Andrea's World Reviews: Enjoy Haircare Review and GIVEAWAY! Every time I wear my hair down, I always get a ton of compliments. People are just drawn to the length. Most do not really realize how hard such long hair is to care for. The longer(and therefore older) the hair gets, the more damage it suffers. After awhile it starts to really take it's toll. It gets dull and breaks causing dead, split ends. But also, longer hair is heavier, so my poor hair is lifeless. I always see the commercials with the beautiful, bouncy hair, and it makes me so jealous. My hair always flat. I have found some products that are really good at nourishing, moisturizing and repairing my hair. That make it shine and such, but so far, volume is the area that I always struggle the most. That is why I am so thrilled to have found such an awesome volumizing collection from a really fabulous brand. Enjoy Hair Care is a premium quality brand. I recently had the pleasure of trying their Rejuvenating Volumizing Collection. These products are incredible. First of all, I want to rave about the packaging. It is so sleep and simple, and yet so fabulous. I love how the Shampoo and Conditioner line up to form one star. That is so creative. This shampoo is so wonderful. It really is rejuvenating, the scent is very fresh and minty. You get a gentle tingle that really wakes up your senses and gives you energy and refreshes your hair, body and mind. The lather is super right and fluffy. The fact that this is sulfate free is so unbelievable, the luxurious texture is so indulgent. It makes you feel so pampered. This rinses super clean too. No residue. It also does not strip your hair of nutrients or natural oils. It really makes hair light, clean and soft. Wonderful shampoo. This conditioner is so incredible. It has the same refreshing mint scent as the shampoo to help you feel energized and invigorated. This is so smooth and creamy. It is thick, but not too much. It coats hair so easily and evenly. Hair just drinks up the moisture. It rinses clean and leaves hair feeling fuller, thicker and volumized, but not heavy or weighed down. It does not feel greasy or leave a nasty residue. Hair looks shiny, soft and totally healthy. Plus it is bouncy and light. It feels so free. I love it. I usually do not use styling products. Mousse especially is not something I am ultra experienced with. I really love this though. It is so easy to use. It only takes a small amount to distribute through all of my hair. It does really add the bounce that I have been craving, so that is what I really care about. The scent is heavenly though. This has more of a fresh floral scent than the mint that the others heavy. It is more feminine and sweet, I love it. I love the results that I got with these incredible products. My hair has not looked this thick and bouncy in a long long time. I know it would be even more dramatic on shorter hair too. This is not the best picture, but I hope you can see how amazingly these products transformed my hair. I would love to hear your thoughts about Enjoy products(weather you've tried them or not), how these worked for me, or anything else you want to say. And since seeing is believing, Enjoy and I are giving away this very same collection to one very lucky winner. Enter below. Good luck. First... MINT is one of my favorite scents. Second, I would love for my hair to look bouncy and healthy! I like that the products sound very light to wear. I have never tried Enjoy haircare. But from your review I think I would love the Mint scent. I love that it doesn't strip your hair like other shampoos. I love that it will help add volume to my fine limp hair. The mint scent sounds really nice, too! I've never tried Enjoy, but I sure would like to! Great review! I like that Enjoy hair care products can make my hair plumped up with volume and give my hair such a great smell without weighing down my hair! I love the look of the products and I love the leave in conditioner!! 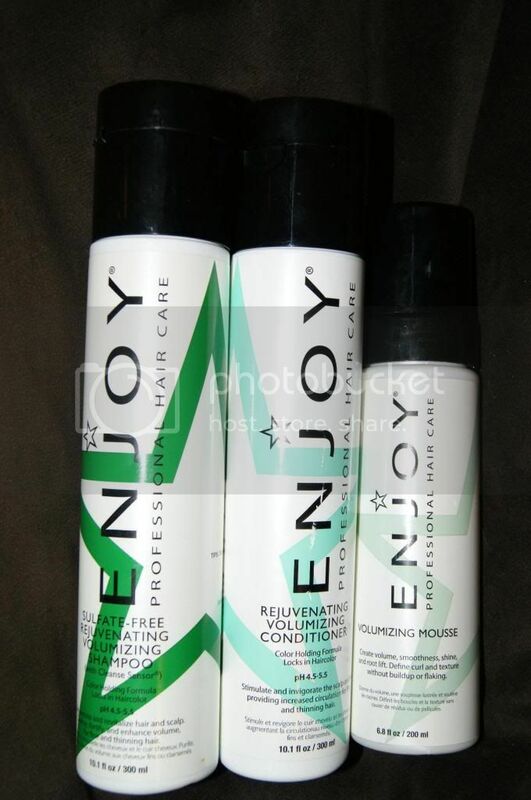 I love Enjoy Hair Care because their products are sulfate free and are absolutely amazing! I have their shampoo, conditioner, and straightener and my hair has never looked so amazing! 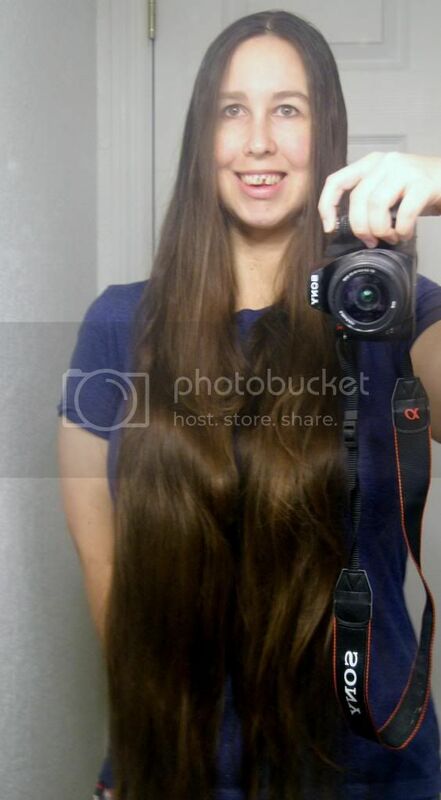 Such beautiful long hair! I cut mine of not to long ago since I could not handle it.. I miss it now lol That shampoo/conditioner makes your hair look fab! Love the volume it gave to your hair, it's noticeable and looks really nice! The look, the feel, and I love minty scents!! I have to admit, I'm drawn to the minty scent. I love scented hair products and it would be great for my frizzy at times hair! Sounds like another great hair care product! You look great!!! it makes your scalp feel great! mint smells amazing! i love it and its sulfate free! That it's volumizing. My hair is pretty thin in places and fine too. I bet this would really help. He first greased the hair, next arranged it around a frame of cloth and wire, then stiffened, powdered and finally decorated it with ornaments, ribbons, jewels or feathers.